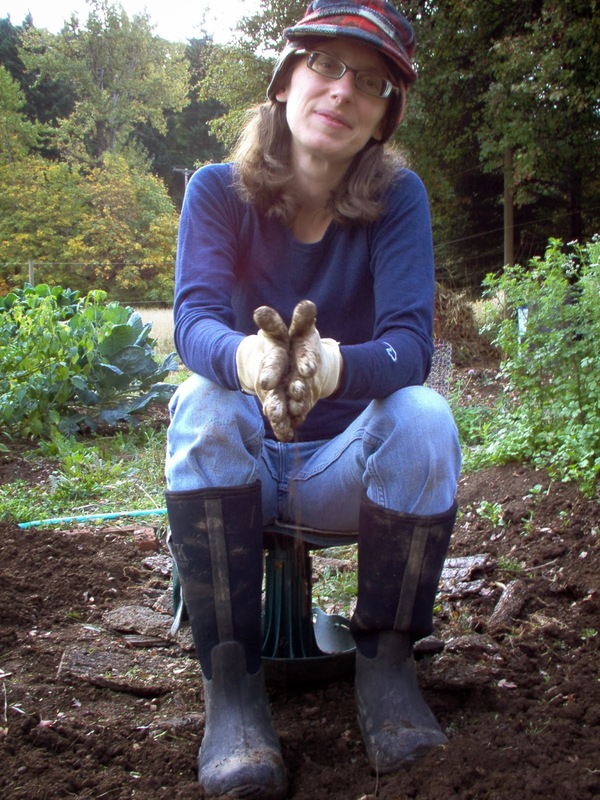 Niki Jabbour - The Year Round Veggie Gardener: Book Review - Get Your Pitchfork On! Book Review - Get Your Pitchfork On! Like many book lovers, I take a book with me wherever I go. You just never know when you'll get a chance to crack open that spine for a few minutes. Plus, it ensures that I'm never bored while waiting - whether in a line, at appointments or even while the kids have their piano lessons. In the past few weeks, Get Your Pitchfork On! The Real Dirt on Country Living has become 'that book' for me - and I still feel like I've only scratched the surface! 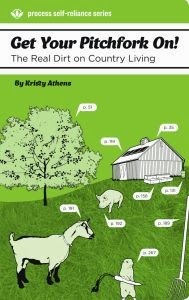 Written by Kristy Athens, this comprehensive book details the (often witty) journey of Kristy and her husband Michael as they made the switch from urban to rural living. I expected that it would mainly focus on growing food crops like veggies, fruits and herbs, and also cover farm animals, but Kristy doesn't even begin to talk gardening until page 181! The book kicks off by focusing on aspects of homesteading that aren't often talked about, like picking the right piece of land and how to maintain it. I have to admit that I had a lot of 'I never thought of that!' moments while reading these pages. She also covers 'buildings', a detailed section on the various types of structures you'll find on a farm or small homestead, that also includes information on sustainable power, alternative building materials and many other 'green' ideas. 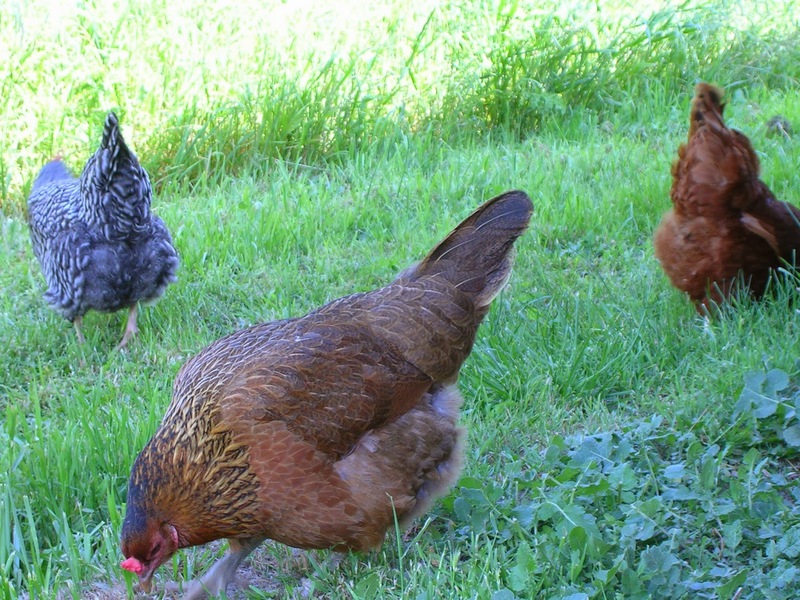 Backyard chickens are rather trendy, and I must confess that I too have been considering adding a coop and a handful of hens to my garden. I have much to learn though and therefore I read the section on birds with much interest. (or maybe I should dig a pond and get some ducks?) But, if birds aren't your thing, Kristy also covers all the common farm animals as well as some that are not-so-common - llamas, alpacas, donkeys, bison and Guinea fowl. 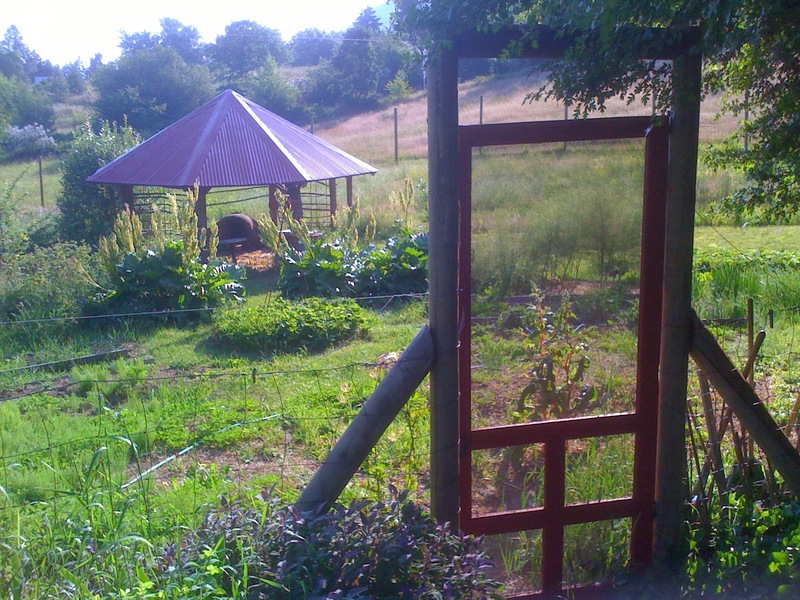 By the time I finally reached the 'food' section, I had already sketched up the one acre homestead I want to build - chicken coops, fruit orchard, veggie garden, duck pond, goat paddock (goat cheese!).. what else do I need? Pizza oven? Definitely! As a year round veggie gardener, I like to leave most of the cool and cold season crops in the garden for fall/winter harvesting. Yet, if that's not for you, Kristy outlines harvest and storage tips for a wide variety of individual vegetables and fruits. (When she described her pesto making process, my stomach literally grumbled!). The bottom line - This book offers honest advice from someone who hasn't just dreamed of the country living lifestyle, but has actually done it! 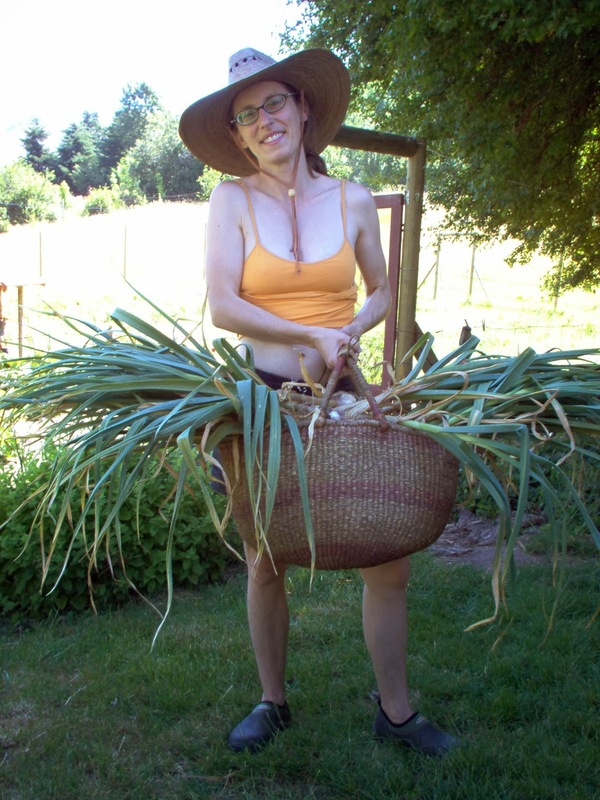 Kristy will prepare you for a wide range of situations that come up - usually unexpectedly - and give you the tools you need to create your own rural paradise. Her writing style is very readable and there were plenty of 'laugh out loud' moments as I enjoyed some of her 'back to the land' adventures. Two green thumbs up! 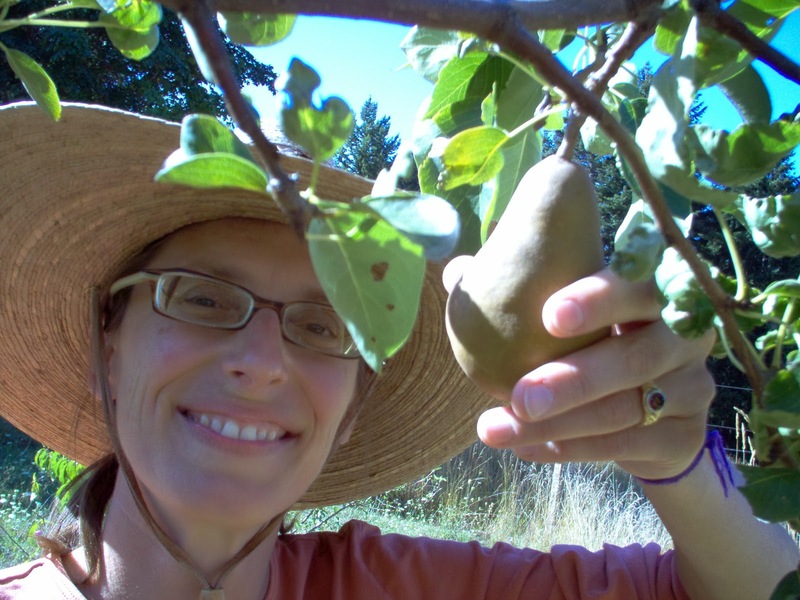 Picking pears on her homestead! lensies please. This sounds wonderful. Great book review.